The Brand Monitoring tool allows you to track up to 3 campaigns in a single Project and adjust your settings in the following ways. To add an additional campaign to your project, simply click on the green + add campaign button in the top right of your dashboard. Once clicked you will be brought to the same configuration wizard used when you set up your original campaign. Once your additional campaign is set up, you can switch back and forth between them by simply clicking on the campaign drop-down menu. You always have the option to edit the settings of your existing campaign. To do this, just navigate to the settings icon directly next to the “+add campaign” and “email reports” buttons at the top right of your dashboard. Once you click on the settings icon you will be prompted with two different options, edit campaign and delete campaign. Under the edit campaign widget, you will be able to add or change any of your main keywords, change your country or language, include more keywords or exclude keywords. Whichever route you take will depend on your needs and the original settings you assigned when creating this campaign. Excluding keywords can come in handy if you’re noticing terms that keep appearing in your mentions that you don’t want to see. 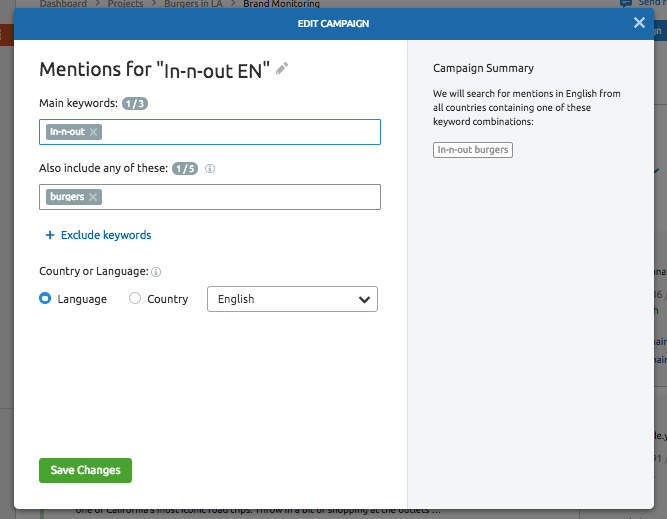 You can also add more “words to search in mentions” to change the scope of your campaign.